This year marked the 20th anniversary of the Joliet Rotary Youth Leadership Conference. 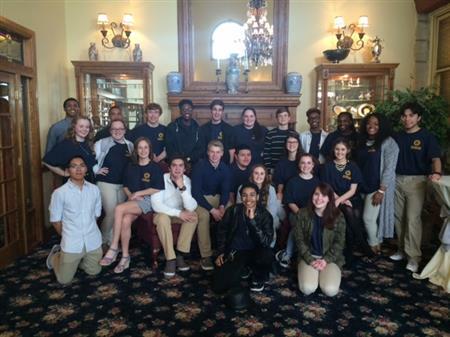 The two-day conference was held on March 20 and 21 and included nine students from each of Joliet’s three high schools, Joliet Catholic, Joliet Central, and Joliet West. Topics of the conference included: leadership; decision making; communications; and ethical issues. Rotarians from various disciplines spoke to the students about these topics. The speakers were Rotarians Brother James Gaffney, Ed Dollinger, Mike Hennessy, Ken Mihelich, Brian Benton, Debbie Condotti, Kate Schott, Dr. Charles Coleman, Damon Sloan, Neil McManus and Mike Trafton. Also presenting were: J.D. Ross, Judge Dinah Archambeault, Senator Patrick McGuire, Scott Slocum, and Brian McDaniel. Rotarian Mary Jaworkski has been coordinating the conference for the past 15 years. Rotarian Jen Howard has been working with her for the past five years.